Till ka khatta is a accompaniment for Khichdi which is prepared using tamarind water and roasted and ground sesame seeds. You can also eat khatta with plain steamed rice and I am sure it will be a great combo. My husband had been asking me to make khatta for a very long time but I always make either Kheema, Tomato chutney or Anday ka salan (egg curry) to go with the Khichdi. I finally searched on google to pick a khatta recipe and it worked out fine. 1. Extract tamarind pulp or use tamarind paste. 3. Dry roast sesame seeds and then the groundnut (if using) separately. 4. Blend the roasted sesame seeds and groundnut (if using) to a paste in a blender with some water, chilli powder, turmeric powder and salt. 5. Add this paste to the tamarind water, mix well. 6. Add the sliced onions, coriander leaves and the mint leaves and mix well. 7. Heat oil in a pan, add the cumin seeds and when they turn slightly brown add the curry leaves. 8. when the curry leaves turn lightly brown, turn off the flame and add this to the prepared tamarind water. 9. Enjoy khatta with khichdi. 1. The remaining half cup of water or even more water is used to pour into the blender jar to remove the paste completely. 2. Adjust the tamarind and water ratio to achieve consistency of your choice. 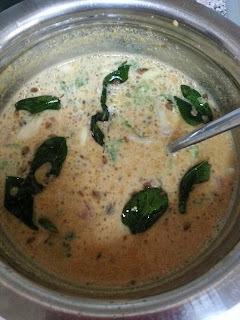 I found this recipe for khatta online from a blog but did not make note of the website. I will pass on the credits as soon as I find the right link. In the meantime if you find this recipe and think it belongs to you then the credit for the same is all yours to take.